In the Eighties of the 16th century, the Grand Duke Francesco I and his friend and collaborator, the architect Bernardo Buontalenti, started the project of the Tribuna. It is the most important room at the first floor of the Uffizi palace, which ground floor was – at that time – occupied by the Florentine magistrates. 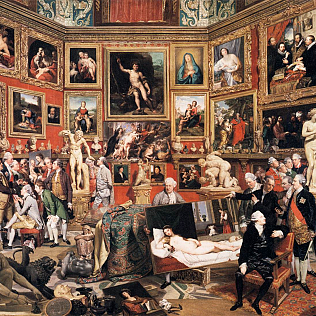 The Tribuna was the first nucleus of the Uffizi Gallery: it is a space conceived and realized to display to the public artworks considered the most precious of the Medici collection. Till then, the members of the Medici family had exhibited its paintings in the rooms of Palazzo Vecchio, where they lived until 1540. In addition to the paintings, that adorned the halls of the palace, there was a series of precious objects, preserved in the private Studiolo of Francesco I, inside dedicated armoires. On the contrary, in the Tribuna every detail ensured that all the artworks could be admired by the public, following an itinerary. Construction work started in 1581 and it finished in 1583. The room is characterized by the octagonal plan and the high walls. Walls terminate with a double drum and a lantern. These elements – with their windows – ensure that the Tribune has a natural enlightenment, as in modern museums. The Tribune – in its composition – represents several meanings. First of all, a clear reference to the four elements: the lantern for the air; the red velvets on the walls for the fire; the – now lost – frescoed plinth with elements from water; the marble mosaic of the pavement, for the earth. However there is also a twine of hidden meanings, not so simple to understand. It is important to remember that Francesco I dabbled in alchemy, and this seems to be the key to other interpretations, but academics are still discussing about them. Anyway we can notice that the prevalent colors are the same of the emblem of the Medici, while the shells on the vault refer to the emblem of Bianca Cappello, the woman that the Grand Duke loved for a long time, and that he married in the same period in which the Tribuna was built. Finally, the octagonal plan recalls the style of baptisteries and ancient churches. So, it is a kind of profane temple, dedicated to art. From the 16th century till today the Tribune has been subjected to changes. Some artworks have been relocated or replaced, as the little temple that was in the center of the room. Here, nowadays there is the octagonal table in semiprecious stones, by Jacopo Ligozzi. In the 17th century the arrive of a series of ancient sculptures – from Villa Medici in Rome – has been very important, above all for the presence of the Medici Venus. In the 18th century, when the House of Habsburg-Lorraine arrived in town, the Gallery was reorganized according to the Neoclassical style. Many objects – originally in the Tribune – were relocated in other museums, so paintings and sculptures had more space. In the last years, the most ancient room of the Uffizi Gallery is at the core of the Digital Museum project. A multimedia installation lets us to observe a 3D version of the sculptures in the Tribune, so you can admire their details and the marvelous project of this room.